Britta Ambauen drew on some vintage inspiration to create this map of French wine regions. 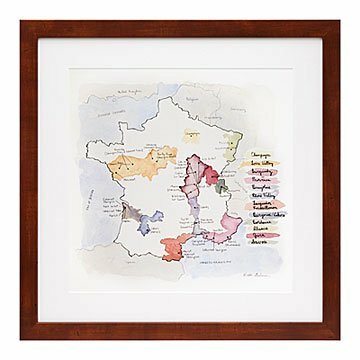 Britta Ambauen drew on some vintage inspiration to create this map of French wine regions: "I start by drinking lots of French wines," she explains, "talking about their virtues with words like c'est bien! or intéressant... Looking to my favorite maps of France, I start with delicate pencil lines, laying out the shapes of the wine regions. Then, I use colored pens to go over the most significant lines and write in the names of the regions." Britta saves the best part for last: "I squeeze out little blobs of yellow ochre, alizarin crimson, cobalt, and indigo and mix subtle shades to define each region, reflecting the hue of the wines most commonly produced in each area. This part requires classy jazz to fill the air and—it goes without saying—a glass of Burgundy positioned far enough from the paper to avoid disaster." Britta adds the perfect serving suggestion: Hang the print over your kitchen table or wherever you like to sit and taste new wines. Digital print from Britta's original artwork. Printed and framed in Portland, OR. Unframed Print: 17" x 17"; Framed: 20" x 20"
I purchased the France and Italy Wine Regions framed prints for myself and my parents. They are perfect for dining room art. Our guests have enjoyed locating our dinner wine to the region on the map.